The theme of our mural is ‘Community’. To get a sense of community the Mural team talked to the children, sent out a survey to the school families and spoke to Madeleine McGilvray for a historical perspective. Akotoa helped with part of the Kahikatea tree. Kawaka mosaicked the sun, moon and mirrors. And Matai had fun painting the soil bugs. As the mural was part of the focus on Visual Arts a variety of mediums were included for example: pottery, mosaics, stencilling and painting as well as 3D and layering effects. The base colours in the mural represent the flat and gently rolling lush green landscape with ponds and puddles often occurring due to our plentiful rain! 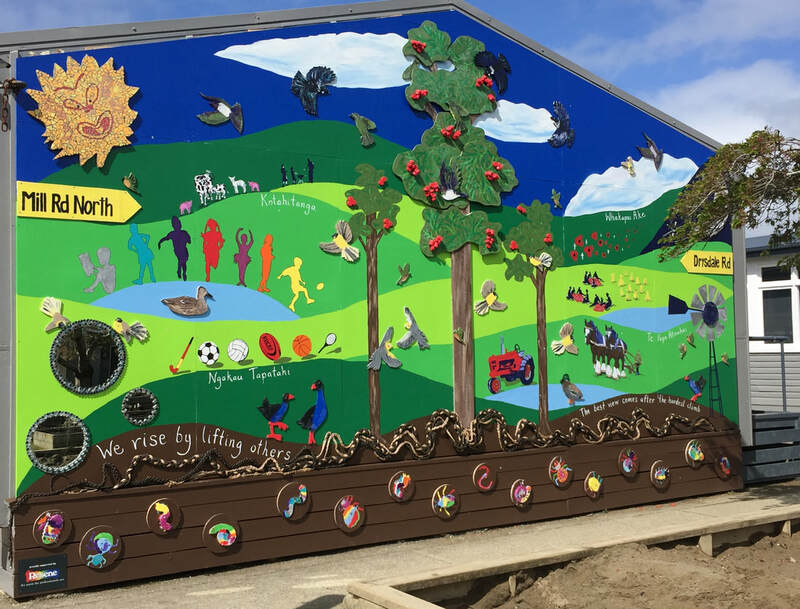 The Kahikatea tree that represents our school and historically was very common in this area is depicted in the centre of our mural. It is a good picture of community as it gains its strength by intertwining its roots with others for support. Poppies and Crosses are on the mural because it is important that we remember the local soldiers who served our country in three wars . People who helped to make our community a good place for us to live. Draught horses and Tractor show us how much farming has changed over the years. How hard it must have been in the old days. Wheat sheaths and the picnics show the community pulling together at harvest time and helping each other and celebrating together. The Windmill represents farmers who developed pump systems to get water around their farm, it reminds us of the innovation which we still value in our community and school today. Drysdale Road was where the original school site was. The sports and activities on this side represent the things children said they love about Myross Bush School; sports, dance, learning and friendship. Sport also provides a big connection for parents and community and is highly valued in Myross Bush. The animals depict the farming and lifestyle blocks which make up a big part of our community, along with the modern day bbq which play a big part in our social events such as Pet Day. All the birds and the soil bugs are a fun representation of our local fauna. The cockatiels are a nod to Irene Tresidder who overseas the school aviary and has been a faithful part of the school community for over 34 years. The mirrors are for the present, you as children and family and friends can see yourselves in them. You are the now, you make up the community. There are numerous others who have contributed to this project. Thank you all! It is wonderful to have a multi medium mural celebrating our community! The first school to be held at Myross Bush was in a stable on Mr Garey's property. In 1866 a school and school house were built on Drysdale Road but when a bush fire destroyed the school in 1868 it was rebuilt on its current site at Mill Road North. The school house was destroyed by fire in 1884 and then again in 1907. It was replaced in 1909. Somewhere around 1915 a new school was built (which is in the photo preceding this page) and in 1930 an electric light was installed in the school! The school became a two teacher school in 1952 and in 1955 it was remodelled and added to. In 1972 Roslyn Bush School was closed and consolidated with Myross Bush School which became a three teacher school. In this same year it also became a contributing school for Rosedale Intermediate (now James Hargest Junior Campus) in Invercargill. In 1977 a relocatable was brought onto the site as the roll had grown to make it a four teacher school. The school stayed at this size until 1986 when, for a year, it dropped a teacher. In 1987 Grove Bush School closed and was consolidated on Myross Bush thus bringing the roll back to a four teacher school again. In 1988 it became obvious that the facilities were no longer adequate. Plans were drawn up for the replacement of the 1915 classroom and remodel of the main block. Two relocatable classrooms were moved on site ready to be renovated. During Term One of 1989 two classes moved into in the renovated relocatable's and the old classroom was sold to a local farmer. The roll continued to grow throughout the 1990's as more five acre blocks were created within the farmland around the school. Another relocatable was added in the early 1990's and finally a new roll growth classroom was built in 2007. The school now occupies a mix buildings - from the 1955 main block which now houses two learning groups, four relocatable's that are forty odd years old and one new classroom space. However the space around the school has been modified to suit the needs of todays learners and it is a vibrant and colourful space!